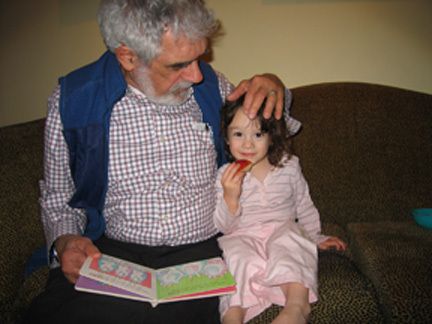 It’s hard for me to write about my dad, Paul Zolbrod, in anything other than sentimental clichés: He’s been my life-long inspiration as a parent, a person, a thinker, a writer. A Native-American scholar for over forty years, he was made fun of, at first, for attempting a poetics of the oral tradition, but the world caught up with him: His translation of the Navajo creation story, Diné Bahane, is still going strong over twenty-five years after publication, one of eight books he’s written or edited. But before he was a scholar, he was a fiction writer. When I was growing up, he regaled me with tales of living in bohemian squalor on the GI Bill. He collected cans to get enough money to buy himself his own tins of beans while he worked on his novel, which is set during the Korean War, when he served in the army. He finished the book, Battle Songs, and submitted it, and had the same kinds of near-misses that so many of us have. The novel was acquired by a press but then dumped when the publisher merged with a more corporate one, a story that suggests that the more things change, the more they remain the same. A decade or so ago, as I was working on my first novel, he revisited his. He revised it, sent it to some presses, got some glowing rejections. My father takes enormous care with his writing, and everything I’ve written of his sings; fifty years after he wrote it, he still believes Battle Songs is the best thing he’s ever written. Putting his money where his mouth is, he eventually self-published, paying for multiple rounds of editing and copyediting, strengthening it each time. A sort of Korean War version of The Deer Hunter, with something to say about Western Pennsylvania coal country as well as combat, Battle Songs is a wonderful book. I recommend it to anyone interested in its subjects, and you can buy it here. One proof that Battle Songs touches on themes that matter is that they are still relevant today. My dad recently wrote an editorial about the legacy of the Korean War, and I’m posting it below. If I hadn’t read this, I certainly wouldn’t have known that this summer was the sixtieth anniversary of that conflict. A Veteran Remembers the Korean War. 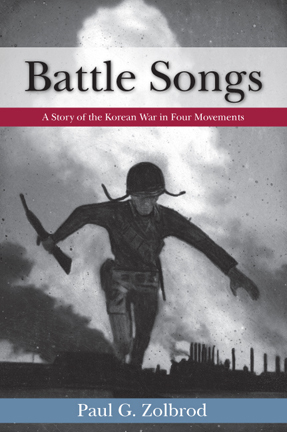 . .
As a Korean war era draftee and the author of a novel about that conflict—Battle Songs—I failed to see much notice that this summer’s sixtieth anniversary of our entry into it has now come and gone. Still unresolved, it remains our forgotten war. Yet it stands as a bleak benchmark in this nation’s history, since it represents the first in a string of undeclared, winless wars that, appropriately or not, brand us as geopolitical meddlers. With the perspective I now have, I even question Truman’s decision to send troops to Korea, although I recognize how difficult that choice was. More clearly, though, I find it nothing short of tragic that following our mighty World War II triumph, we were giddy with invincibility and failed to realize that wisdom does not necessarily accompany military power. Vietnam followed, then Iraq, and now Afghanistan. In between, a series of quick little military exploits strengthened our mindless faith in raw might–Grenada, Panama, a first Gulf War, Haiti, Bosnia, etc.–that only reinforced a “bring it on” bravado, leading us deeper into national debt, arousing international disfavor, and poisoning our national will. I don’t claim a historian’s certitude, but sixty years later I know this. A dark gulf of insensitivity separates managers of the macrocosm who send youngsters to fight from the way lives are shattered in the microcosm of combat in ways unimaginable to anyone lacking military experience. While not having fought in Korea, I live that lesson just the same after sixteen weeks of infantry basic training where I was taught to kill; after sharing a Tokyo Army Hospital ward with wounded soldiers during the aftermath of the war; after weeks of round-the-clock duty as a corporal at Tokyo Quartermaster Depot dispatching emergency supplies to surrounded French troops at Dien Bien Phu; after two stays in a Veterans Administration hospital immediately following my discharge; and even now at the local VA clinic where my disability pales when I meet Vietnam vet comrades still carrying shrapnel in a shoulder or a groin, or a youngster newly returned from Iraq or Afghanistan learning to walk on a prosthetic leg. For all these years the reality of callow youngsters sent to Korea virtually unnoticed still haunts me. As a boy during World War II, I remember trolley rides to Pittsburgh’s Baltimore and Ohio station to watch newly drafted soldiers board trains while a band played in a cascade of confetti; and how as a young teen we helped greet them back as mothers and wives and girl friends kissed them tearfully. Yet as a newly sworn-in inductee in the early fifties, I was marched after dark with others through alleyways from the Old Post Office Building to the same station; then boarded an Asian bound troop ship from an empty San Francisco pier; and finally returned to an equally deserted one. We too had embarked and returned, but who cared? Since my discharge in the mid fifties, I have tried to reach an understanding of that conflict from a foot soldier’s viewpoint. In addition to history books, I studied diaries, field reports, battlefield dispatches, front-line hospital records, and even first-hand accounts by Hiroshima survivors. Over that span of time I struggled to complete to my satisfaction a work of fiction that might remind readers of what was being overlooked. It tells the story of four young inductees from Western Pennsylvania mining and farming communities into a war they do not understand to face an enemy they know nothing about. Each in his own way must recognize a legacy of conflict of a different sort absorbed through their upbringing, raising the question of whether as Americans they are already predisposed to combat. On two occasions I actually submitted earlier versions–once while the war in Vietnam escalated, and again after the first Gulf War. The first submission was originally accepted by a trade publisher, but later cancelled when a managing editor declared that nobody would be interested. The second submission was praised but rejected by a publisher uninterested in historical fiction, which apparently it had now become. War is futile not just for the destruction it leaves. Cities can be rebuilt, as nations in Europe and Asia have demonstrated. It is futile because it recurs for reasons an individual soldier may not always fathom as easily as those who fought in the so-called Great Generation did. It is futile because in it so many die so young. And it is futile above all for what those who survive endure for rest of their lives. That’s why the Korean War remains important in the face of forgetfulness.